That’s a 148-hp engine under the hood offering plenty of power for life in the city and beyond. A Continuously Variable Transmission is matched to it, giving you seamless control and a smooth drive. It’s an efficient engine too, getting an excellent 9.1 L/100km combined fuel economy so you can make far fewer trips to the gas pump. This is an effective blend of power, control and efficiency for an engaging driving experience and an easier time taxiing the family throughout city streets. This RVR SE is packed with features drivers always appreciate having. Alloy wheels, fog lamps and rear privacy glass are all here, the latter adding to your sense of security on the road when the family is in the back. And for when you’re packing up the family and hitting the road, there’s a ton of cargo space available to you. Roap trips? No problem. The kids’ hockey practice? Have fun. It won’t be a hassle, especially with the added convenience of the 60/40 split folding rear seat. Keyless entry, power accessories, heated front seats–it’s all here for your convenience and to make those Canadian winters a breeze. 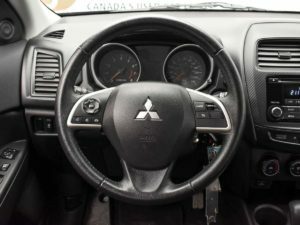 And if you’re like the author of this post and you get a kick out of cruising with the music blaring and windows down, then you’ll love having quick access to the tunes with steering-wheel-mounted cruise and audio controls. 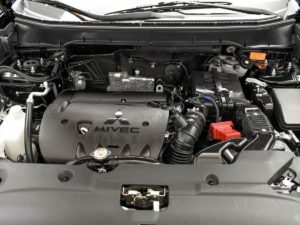 You’ll find a lot of safety and convenience tech inside this Mitsubishi, including hill-start assist, stability control, traction control logic, and seven airbags. Some of these are the most modern safety technologies offered, and you’ll appreciate the peace of mind that comes with knowing your family is protected on the road. With only 65934 kms on the odometer and at $18,900, this 2015 Mitsubishi RVR SE in Leduc is a great deal. It’s also still under it’s warranty of 100,000 kms or 60 months. You’ll also enjoy unlimited kilometres or up to 60 months of roadside assistance. We’ve got this 2015 Mitsubishi RVR SE on our lot right now, ready to be introduced to a new owner, and we welcome you in to take it for a test drive. Get in touch with us to learn more about this 2015 Mitsubishi RVR SE model on our showroom floor.